This is a Key lime tart I’ve been making for 30 some years that never fails to please and it couldn’t be easier to make. There is no baking involved so the tart can be completed in less than an hour. 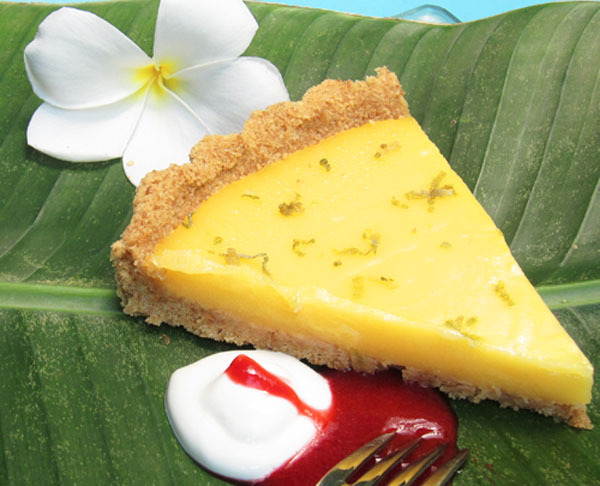 The filling is a simple fresh lime curd that is then poured into a crumb crust and refrigerated…and Voila! The Florida Keys, and Key West in particular, have enjoyed a legendary notoriety associated with the novelist Ernest Hemingway and a bunch of his famous, as well as infamous, cronies that used to hang out until the wee hours of the morning at Sloppy Joe’s and Captain Tony’s in Key West in the 30’s and 40’s. So, by association, the Key lime pie is fondly embraced as an American classic with a smooth creamy custard like filling made with Florida Key lime juice and sweetened condensed milk. The sweetened condensed milk adds a certain element of decadence to the pie, but I myself much prefer the unadulterated flavor of lime curd filling just as it is. While the Key lime certainly holds a certain cache, this type of lime is easily found throughout the West Indies, Mexico, and as far afield as Thailand. Obviously certified Key limes are going to be hard to find, so when you go shopping what you want to look out for are smaller thin skinned limes which will have a more acidic intense lime flavor and aroma than the larger Persian limes you are probably more familiar with. Bottled Key lime juice is available, but don’t be tempted. There is no substitute for freshly squeezed lime juice for this recipe. Break up the crackers or digestive biscuits into the work bowl of a food processor and pulse until you have a fine crumb. Add the sugar and salt and pulse until combined. Then pour the melted butter over the crumbs and pulse until the crumbs just begin to clump together. Press the crumb mixture into the tart pan, being sure to distribute the crumbs evenly, so the crust has an overall uniform thickness. Transfer the crumb lined pan to the refrigerator and chill until the crust has firmed up, about 40 minutes. Zest a couple of the limes before you juice them and set the zest aside. Choose a non reactive stainless mixing bowl the will fit snugly over a wide pan placed below it. Partially fill the wide pan with water and place it over medium heat on the stove top. Heat the water without coming to a boil. meanwhile place the eggs, egg yolks, and sugar into the mixing bowl and whisk together until the sugar is thoroughly combined. Then add the lime juice and whisk until completely incorporated into the egg mixture. Place the bowl over the hot water (being sure the water is not boiling below) creating a Ban Marie. Whisk the mixture in a continuous circular motion without creating a froth. After a few minutes the mixture will begin thicken rather quickly, so once the mixture has the consistency of a soft custard like curd, promptly remove the bowl from the heat. Scatter the small cubes of butter over the surface and once melted gently fold the butter into the curd until completely incorporated. 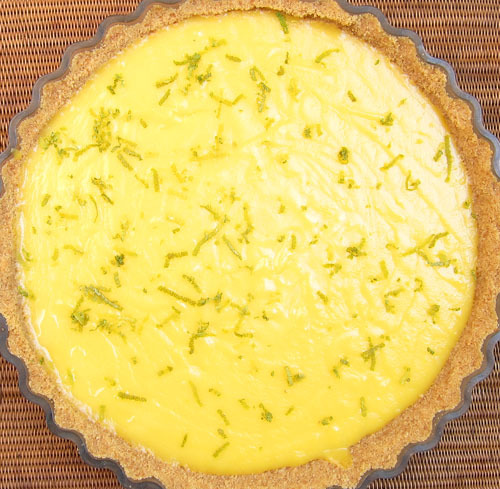 Remove the chilled crumb crust from the refrigerator and pour the lime curd filling into the crust shell. Giggle the pan gently to even out the filling and, if necessary, gently smooth the surface with a spatula. Distribute the lime zest over the surface and return the pie to the refrigerator until the filling has firmed up. You can then cover the pie with cling film and refrigerate until you are ready to serve. As pictured serve the tart with a strained strawberry or raspberry puree along with a dollop of sour cream or crème fraiche. The holidays have arrived and, like myself, you are probably finalizing menus and about to dash off to the local farmers market, the grocery store, and your local delicatessen with shopping list in hand. Tis the season for home cooks to go into overdrive and, once again, manage to put a noteworthy holiday feast on the table with a certain air of relaxed aplomb. Christmas in Buddhist Thailand is a non event other than retail of course. So every year rather than cooking a traditional western Christmas dinner I gravitate towards a meal drawn from another culture. This year I am doing a Mexican Christmas supper beginning with a Sopa de lima from the Yucatan (click here). Following that a succulent Barbacoa (click here) from central Mexico along with frijoles refritos (click here) and a spicy slaw with apples and avocados. For dessert I’ve come up with a recipe for Mexican Chocolate Lava Cookies that will be served with cinnamon ice cream drizzled with caramel sauce. Cocoa is native to Mexico and often combined with cinnamon and, yes, chile in both savoy and sweet dishes that date back to the Aztecs. The soft chocolate “lava” chunks in these cookies are a reference to the active volcanoes that dot the landscape in central Mexico, and the caramel sauce is a nod to the Spanish influence in Mexico’s evolving cuisine. I have adapted this recipe from a recipe by Jacques Torres for his now famous chocolate chip cookies that forever changed the conversation about what the best chocolate chip cookie should be. There may be just enough time left to add these cookies to your holiday preparations, but if not do try them first thing in the new year! Ideally make the cookie dough 24 hours before baking. Preheat the oven to 325 F/ 160 C with the baking rack set in the middle position. Spread out nuts in a single layer in a baking tray and toast them in the oven until they are fragrant, about 10 minutes. Remove the nuts from the oven, set them aside to cool, and turn off the oven. When cool break the nuts up by hand and set aside. Combine the cake flour and bread flour in large mixing bowl and stir to combine. Combine the butter, brown sugar, granulated sugar, baking soda, baking powder, salt, cinnamon, nut meg, allspice, and red chile powder in the bowl of a stand mixer fitted with the paddle attachment, and cream at medium high speed for 5 minutes or until the mixture is a light color and fluffy in texture. Add the egg and mix on medium speed until the egg is completely incorporated into the dough. Add the vanilla and mix to incorporate. Reduce the speed to low and add the flour mixture and mix until the flour is completely mixed into the dough. Remove the bowl from the mixer and add the chocolate and nuts and, using a silicone spatula, mix until combined. Cover the bowl with cling film and refrigerate for 24 hours. Preheat the oven to 350 F/ 180 C with the baking rack set in the middle position. Set up 2 cooling racks. Remove the dough from the refrigerator and, using a scale divide the dough into 1 ½ ounce portions. Roll the portions into balls between the palms of your hands. 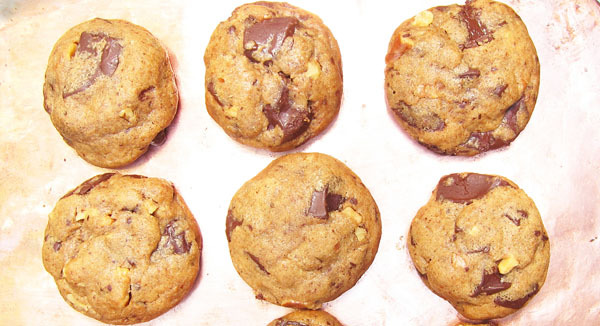 For best results, baking one tray of 6 cookies at a time will deliver the best results. Refrigerate the remaining balls of dough until you are ready to bake them. Place 6 balls of dough on the tray with plenty of space between them. Top each ball with a light sprinkle of crystallized salt, patting the top lightly so the salt sticks to the surface. Transfer them to the oven and bake for 6 minutes. Open the oven and rotate the tray from front to back and bake another 6 minutes. The cookies should be just slightly golden but still very soft while not looking overly moist on the middle of the top of the cookie. You do not want to over bake these cookies so their texture will remain soft, the chocolate still holding its shape, once the cookies are cool. When done remove promptly from the oven and place the tray on a cooling rack for 5 minutes. Then gently remove the cookies from the baking sheet and place them directly on a cooling rack. Repeat the same process for the remaining cookies. 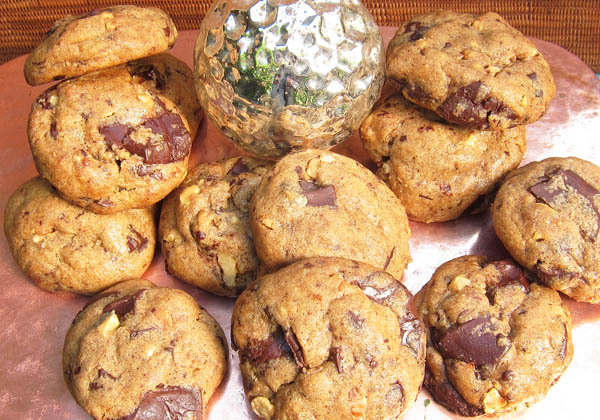 When the cookies are nearly cool you can serve them at once while still slightly warm. Otherwise let the cookies cool completely and then store in a large cookie tin with the cookies stacked in just 2 layers. As mentioned these cookies are ideal served with cinnamon ice cream. The caramel sauce is optional, but it does make a very special taste of Mexico. 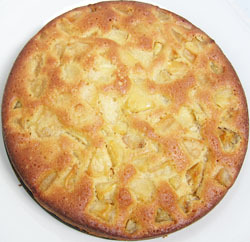 I have read quite a few recipes for this very simple French apple cake over time, but never actually got around to making it until a few days ago. What an unexpected revelation! My expectations, as simple as this cake appears to be, were delightfully misconstrued. This cake is absolutely delicious in the best possible ways. 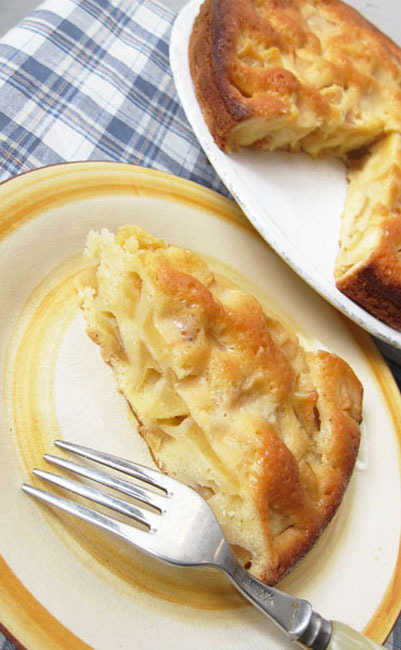 Its moist buttery custard like texture surrounding tender chunks of apples is pure perfection. Neither too sweet nor fancy, this is a cake I, and hopefully you, will be baking again, and again, and again. The secrets to success here are using a variety of absolutely fresh crisp apples and the best quality butter you can find, preferably a French butter or a full fat brand of butter in North America. In my kitchen I like to keep on hand a serviceable butter for cooking and a French butter for baking and for spreading on bread and toast. The quality, flavor, and color of the butter you use when baking is going to significantly impact the overall flavor, texture, and indeed the aroma of all your baked goods. Fat content matters. French butter has maintained centuries old standards in how the cows are fed, the quality and culturing of the cream, and producing a higher butter fat content that supports flavor as well as a supple texture. President brand is a serviceable French butter that is widely available in grocery stores in the US and Europe and well worth the extra coins spent. Other brands to look for in the US are Plugra, Keller’s European Style, and Land O’Lakes extra creamy butter. In a small saucepan melt 8 tablespoons of butter and set aside to cool. Peel the apples, cut them into quarters, remove the cores, and cut into 3/4 inch chunks. Place a large skillet over medium heat and add 1 tablespoon butter. When the butter is melted add the apples and toss until coated with butter. Then sprinkle 1 tablespoon sugar over the apples and cook for about 6 to 8 minutes or until the apples just begin to color. Transfer the apples to a large plate and set aside to cool. Preheat the oven to 350F/180C with rack centered in the oven. Top the rack with the baking sheet. For this recipe I would suggest using an oven thermometer to be sure the oven temperature is spot on. Generously butter and lightly flour an 8 or 9 inch springform pan. In a small bowl whisk together the flour, baking power, and salt and set aside. In a mixing bowl whisk the eggs until foamy. Add ¾ cup of sugar and whisk vigorously until well combined. Add the vanilla and rum (or Calvados) and whisk until combined. Then whisk in half the flour mixture until combined. Then add half the melted butter and whisk. Add the remaining flour mixture and melted butter and whisk until the batter is smooth and thick. 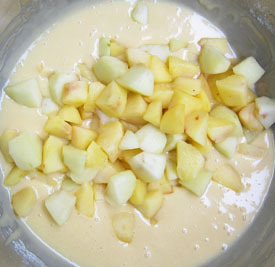 Then add the apples and, using a silicon spatula, fold them into the batter until evenly coated. Scrape the mixture into the springform pan and level out the top a bit. Sprinkle the top with a tablespoon of sugar and transfer to the oven. Monitor your temperature and baking time carefully. Total baking time will be between 50 and 60 minutes. You want to rotate the cake after 25 minutes for even baking. Be careful not to over bake this cake as you want the texture of the cake to be very moist with an almost custardy texture. The cake will be done when a knife inserted into the center of the cake comes out clean. The batter should be just set as it will firm up a bit once taken out of the oven. When the cake is finished set it out on a cooling rack. After about five minutes run a small flexible pastry spatula around the sides of the baking pan, open the side the pan, and remove it. Best to let the cake cool completely before transferring it to a cake platter. 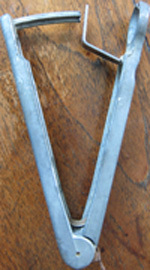 The easiest way to do this is to run a small flexible pastry spatula around the edges of the cake. Then slide a long pasty spatula under the cake to gently release it and then slide it onto a cake platter. This cake should be served either warm from the oven or at room temperature. The cake is just perfect served as it is, but if you like add a dollop of whipped cream or crème fraiche, or a small scoop of vanilla ice cream. Less is more in this case. It’s cherry season in the northern hemisphere judging from the abundance of fresh cherries from the US and Canada that are available in the supermarkets here in Thailand at the moment. Cherries do not grow in the tropics so they are a real indulgence that is well worth savoring, if ever so briefly. 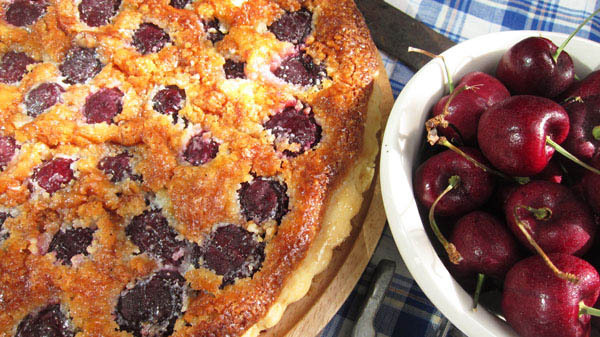 As a cook, what immediately came to mind was making a classic Italian/ French fresh cherry frangipane tart. Making tarts can get complicated, but this tart is relatively easy to make and beautifully showcases the plump whole fresh cherries nestled into a frangipane (almond flvored) cream and baked until golden brown. The scent of almonds wafting through the kitchen seductively compliments the juicy sweet tartness of the gently softened cherries. 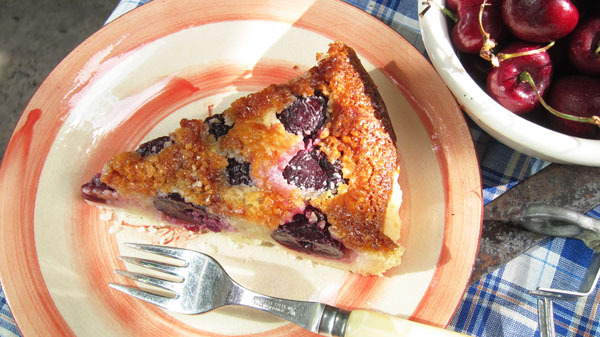 Bing cherries are your best choice for a fragipane tart. They are plump, firm, deeply colored, and have a crisp sweet sourness. To pit or not to pit the cherries? 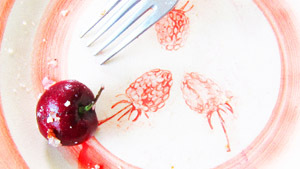 Some cooks do not, but pitting the cherries requires so little effort. Cherry/olive pitters are available online, worth the small investment, and will last a lifetime. Other fresh stone fruits you may want to try for this recipe include apricots, nectarines, plums, or peaches. Your favorite pasty dough, well chilled, rolled out, and fitted into a 9 inch tart pan. Place the almonds and 2 tablespoons of sugar in a food processor and blitz until the almonds have been reduced to a stone ground flour like consistency. Place the butter in the bowl of a stand mixer fitted with the paddle attachment and beat on medium speed until the butter is creamy. Scrape down the sides of the bowl and add the remaining sugar and beat until fluffy, about 1 minute. Once again scrape down the sides of the bowl and add the almond mixture and mix until thoroughly combined. Then add the salt, rum, and almond extract. Mix until combined. Then add the egg and milk and mix until light and fluffy. If you are not using the frangipane cream right away, cover and refrigerate. Be sure to bring the cream to room temperature before assembling the tart. Remove the pastry lined tart pan from the refrigerator and spoon the frangipane cream into the trat shell and even out the surface with a silicone spatula. Arrange the pitted cherries over the entire surface of the tart, pressing ever so gently so the cream just anchors the cherries in place. Transfer the tart to the oven and bake until the pastry crust is lightly browned and frangipane cream has puffed up and golden brown, about 50 to 60 minutes. Turn the tart after the first 30 minutes to insure even baking. While the tart is baking heat the jam in a small pan until melted, strain out the solids, and set aside. When the tart is done transfer to a cooling rack. Brush the glaze over the top of the tart and cool to room temperature. Serve cut into wedges. This tart needs no flourishes. Beautiful just s it is.